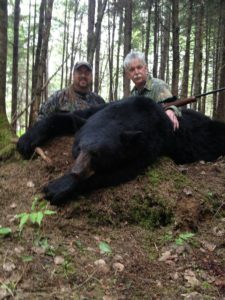 Ted Nugent Sunrize Safaris offers excellent black bear hunts in New Brunswick with both Spring and Fall dates available. Book your spot for 2019. This camp is the leader in black bear hunting. $3550 per hunter plus $184.19 license. Hunters may hunt with bow or rifle during the spring season. Our camp runs at least 200 active bait sites each season and has near 100% shot opportunity. Excellent meals, comfortable accommodations, and very experienced Guides! Sunrize Safaris also books hunters for the fall season as well. Please contact us for dates. Reserve your spot for the Sunrize Safaris group trip. Join Paul Wilson arriving June 23, 2019, and hunt June 24 through 28. Depart on June 29, 2019. It’s the trophy time of the season! We are booking for the entire 2019 Spring season. Many dates available. Email us for information! For details contact Paul Wilson at paul@tednugent.com or 800-343-4868!